Diane and Peter Troy opened their house to Randy Flores and his technical crew for the summer. It's reminiscent of 19 years ago, only now video equipment replaces bats and baseballs. 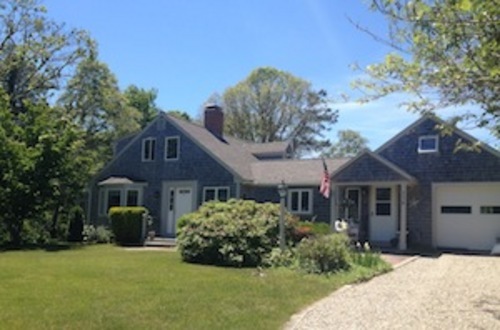 After an outstanding career in the majors that included being drafted in 1997 by the New York Yankees in the ninth round after his senior year at USC and a World Series nine years later with the St. Louis Cardinals, Flores has returned to Cape Cod and is living with the same family that hosted him back in 1995. With this new venture, Flores hopes to make more baseball and softball information available through video clips of individual players. Today, Flores is the founder and CEO of OnDeck Digital, a video company that does the work for your, delivering multiple angles of edited and tagged baseball clips right to your fingertips. The endeavor has brought Flores full circle, and back to Cape Cod after 19 years to partner with the league and reacquaint with old friends. After graduating El Rancho high school in Pico Rivera, Calif., Flores played baseball for the University of Southern California, where he set a record for all-time wins. After playing in college and the pros – and in between spending the summer of 1995 pitching for Chatham – Flores decided he wanted more. He went back to school to earn his master's at USC, working as an assistant baseball coach during the day and taking classes at night. It all paid off for Flores, who graduated last month with a master's degree in postsecondary administration with an emphasis on athletic administration. USC is where the idea for his business was born. While working as an assistant coach, Flores noticed that amateur videos shot at games were outdated and of poor quality. Flores wanted to come up with a way to bring professional-qualify video to amateur baseball while highlighting a player’s specific performance. 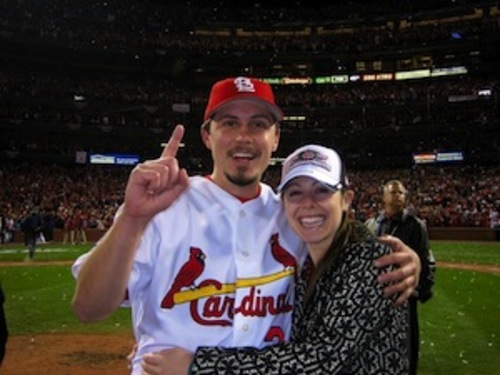 Randy Flores (Chatham, 1995) and wife Lindsey during the 2006 postseason. Flores, in his own words, about the experience of winning the World Series: "I pitched in seven games in the 2006 Playoffs, including being the winning pitcher of record in Game 7 of the NLCS. I threw one scoreless inning in Game 2 of the World Series. In Game 7, I have never been more nervous and more focused in my entire life. It was a surreal moment. And, to pitch well in that moment, and then feel like a part of the reason we were dogpiling on the field and popping champagne in the locker room, brings an enormous feeling of gratitude and appreciation for being so lucky to be in the right place at the right time." “I am throwing all the passion I had for baseball and putting it in my new company,” Flores said. "I was disappointed with the video capture options of amateur baseball and softball players. Highlight reel companies are overcharging for completely useless footage of slow motion 60-yard running. Parents are pressing their cameras through a chain link fence instead of clapping and cheering on their kids. Coaches and scouts are spread thin and can’t be everywhere. Most live streaming is expensive and provides an inferior viewing experience." OnDeck Digital allows players to view the game from the crowd’s perspective. It enables athletes to see what they did well and what they could improve upon. But this service has even more to offer than that. It provides parents, fans and friends the opportunity to view previously played games in fast time and on any device. In addition, it's a great tool for scouts. The technology enables viewers to watch an entire game in 30 minutes. “The goal of OnDeck Digital is to create a central repository of on-demand, high-definition video that players, parents, fans, coaches and scouts can easily watch anytime, anywhere,” said Sam Stevens, chief engineer of OnDeck Digital. Letting OnDeck do the work recording and photographing lets spectators simply enjoy the game without worrying about gathering film and photos for a player's portfolio. In today's quick-paced, hectic world, it's hard to find time to watch an entire game. OnDeck's high-definition videos offer the best possible solution, streamlining the viewing and bridging the gap for viewers, making it quick, easy and customizable to a particular player. For players, the benefits of OnDeck are immeasurable. It enables players to evaluate themselves in slow motion and with multiple-angle high-definition views, build a recruiting profile and download clips. As a former baseball player, Flores can appreciate the dedication and hard work players put into their game. As a former assistant coach, he also understands the ins and outs of scouting and evaluating players. Frustrated with the lack of quality in-game video and confident he could fill a void in the market, Flores developed a universal, on- demand database that anyone can view whenever and wherever. “In unprecedented turnaround time, you can get the specific in-game appearances you want to see. For example, if you want to see ‘Jonny at bat,’ then that’s what you’ll get,” Flores said. "OnDeck empowers players to be their best. Lets family, friends, and fans engage the sport they love. And allows coaches and scouts to evaluate like they never have before." For more information and prices, visit ondeckdigital.com or contact Randy Flores directly at Randy@ondeckdigital.com.